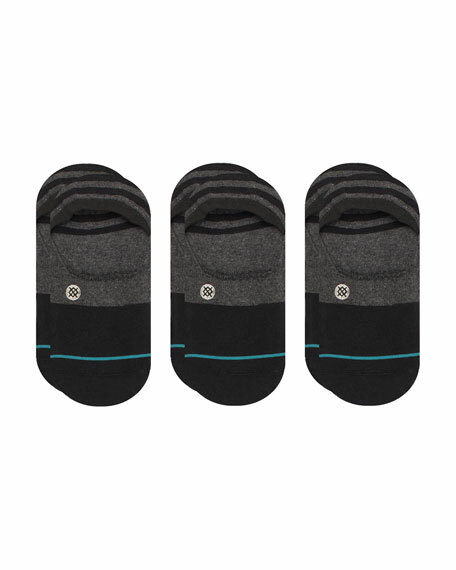 Stance three-pack "Gamut" ankle socks. Solid ribbed cuffs higher at the back to prevent slipping. Observing a void in the market and an unused canvas, Stance seeks to capture creativity and self-expression in an essential garment: the sock. Crafting premium knitwear with refined materials and fresh designs, Stance has given footwear a knew power in fashion. The label has collaborated with athletes, musicians, artists, and celebrities to create uncommon socks that suit every lifestyle. For in-store inquiries, use sku #2416842.